Srinagar: The Lok Sabha election battle in Jammu and Kashmir could not have been more predictable — the Bhartiya Janata Party (BJP) is contesting against the "alliance" of the National Conference, Congress and Peoples Democratic Party (PDP) in the Hindu-majority areas of Jammu, while the National Conference, Congress and PDP are locked in contest among themselves in the Muslim-majority Kashmir region. The prime issues that tie the Kashmir-centric political parties together against the BJP are protecting the special status of Jammu and Kashmir to retain the exclusive rights of the state's residents on jobs and property, as well as preventing any direct application of Central laws in the state. At the core of the BJP's political ideology with regard to India's northernmost state is abrogating Article 370 of the Constitution of India, which bars any extension of Central laws to Jammu and Kashmir without the state government's clearance. This is what led to an "electoral alliance" among the National Conference, PDP and Congress in the state. The BJP has also sought to have Article 35A revoked, which prevents people from outside the state from getting jobs or voting in the Assembly elections in Jammu and Kashmir. 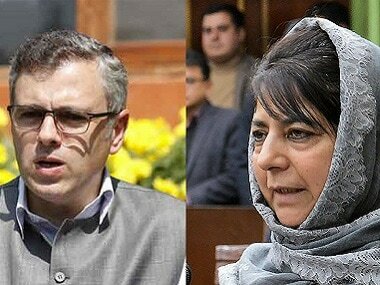 File photos of Omar Abdullah and Mehbooba Mufti. Although there were no talks between the Congress and PDP over seat-sharing from the two Lok Sabha constituencies of Jammu and Udhampur, former chief minister and PDP president Mehbooba Mufti had said in March that her party will not field any candidates from these seats to ensure that secular votes are not divided. 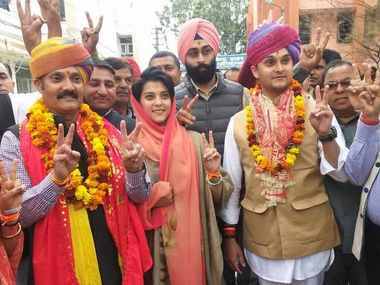 The contest is restricted to the Congress and BJP in these two seats in Jammu, whereas all parties have fielded candidates from the three seats in Kashmir. Ladakh is the sixth Lok Sabha constituency in Jammu and Kashmir. The fight to retain the "special constitutional" position of the state with a separate flag and Constitution — and now former chief minister Omar Abdullah's call to revive the posts of 'sadar-e-riyasat' (president) and 'wazir-e-azam' (prime minister) in the state — has become more than a mere election rhetoric with communal overtones. The Congress, National Conference and PDP coming together in the state is being construed as a move to ensure that Muslim votes are not divided in Jammu. The "secular" alliance in this division was formed in the aftermath of attacks on Kashmiri Muslims in the region after the suicide attack on a convoy of the Central Reserve Police Force in Kashmir on 14 February, in which 42 troopers were killed. Before the BJP-PDP broke in June 2018, the "diatribe" that leaders of both parties had resorted to over the eviction of Muslim Gujjars from their homes had soured relations between the alliance partners. Now, all the mainstream political parties in the state are firing salvos at each other, calling the poll promises of their rivals "election gimmicks". 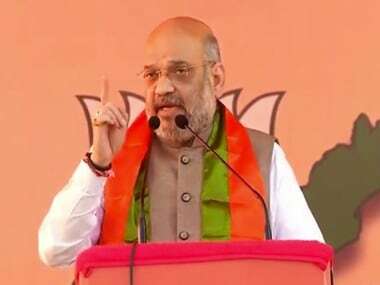 Jammu and Kashmir BJP general secretary Ashok Koul said Abdullah's political campaigns lack any "seriousness", and that his statement saying the National Conference would seek to restore the positions of prime minister and president in Jammu and Kashmir was a "mere election gimmick". However, by calling for the revival of the two offices in the state, Abdullah has also raised a pitch for the Assembly election by also promising to revoke the Public Safety Act (PSA) that authorities have abused to detain Kashmiri youth on "flimsy" grounds. The BJP has termed as "toeing a soft separatist line" Abdullah's promise of revoking the PSA and Mehbooba's promise to lift the ban on plebiscite-supporting Islamist party Jamat-e-Islami (JeI). This, even as separatists have asked the people of Kashmir to boycott the "sham polls". In the past, the National Conference had attacked Hurriyat (G) chairman Syed Ali Shah Geelani for its pro-India leaning when the party's founder Shiekh Abdullah had been seeking a plebiscite in Kashmir. Also, the PDP had come to power in Jammu and Kashmir in 2002 in alliance with the Congress as people had voted for the party in areas considered traditional JeI strongholds. In contrast, jailed Jammu and Kashmir Liberation Front leader Yaseen Malik had claimed that former state finance minister Haseeb Drabu had met him in 1996 — much before leaving the PDP — to push his separatist line. Even though separatists have rejected Kashmir's mainstream politicians as "non stakeholders" for any negotiations on the state, instead pinning their hopes on the Central government to initiate any dialogue, Prime Minister of Pakistan Imran Khan had said after the India-Pakistan dogfight on 27 February that there was an Indian leader who was also of the view that "an idea can't be jailed" — a veiled reference to Mehbooba. After she lost power, Mehbooba opted to burnish her image as a pro-separatist leader by also visiting families of militants. She was criticised several times, especially for her remarks that young boys were not going to the camps of security forces to buy toffee and milk, a statement believed to be an attempt to justify the "excesses" committed by the forces on separatists after the killing of Hizbul Mujahideen commander Burhan Muzafar Wani on 8 July, 2016. At her highly-fortified official residence at Gupkar, Mehbooba also proudly displays her photo with former Pakistani president Asif Ali Zardari, which was taken during her visit to the neighbouring country in 2008 as part of a dialogue to resolve the Kashmir dispute. In the current election season, instead of making direct references to their political planks of restoring autonomy and self-rule, the National Conference and PDP have, instead, denounced the BJP for its efforts to abrogate Article 370. 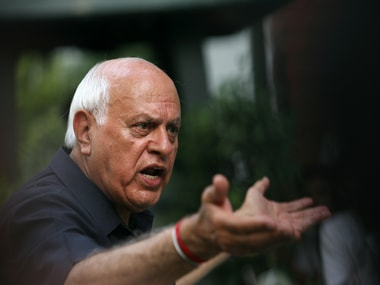 Both Kashmiri parties have asserted that Jammu and Kashmir had acceded with the Union of India on the promise that Article 370 will be retained, which the Congress supports, as well. Jammu and Kashmir Congress president GA Mir said the BJP had failed to have Article 370 revoked despite the majority it enjoys in Parliament, calling the party's renewed push for its abrogation "gibberish". "No power on earth can revoke Article 370. The Congress gave this article to the state," he emphasised. However, former state BJP president Satpal Sharma said retaining Article 370 was helping to strengthen separatist forces in Kashmir. "The Congress should not ally with separatist forces. Under the leadership of Narendra Modi, we will preserve the integrity of the nation," he said. Earlier, separatists said Article 370 should be retained to prevent a change in the state's demography. 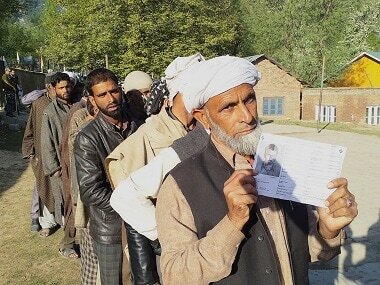 They said allowing non-residents to settle in Jammu and Kashmir could "tilt the vote in favour of India" in the event of any plebiscite in the state. Political commentator Noor Mohammad Baba said Abdullah's call to have the offices of the prime minister and president restored in Jammu and Kashmir was part of his party's plank to restore the autonomy the state enjoyed before the dismissal of former chief minister and National Conference founder Shiekh Abdullah. "The restoration of the offices of the prime minister and president was very much part of the autonomy document of the National Conference," he said, adding that the PDP's self-rule pitch, on the contrary, treated Pakistan as the clear stakeholder on Kashmir. Besides the porous borders of Kashmir, the self-rule pitch also seeks a joint electoral mechanism for the two parts of Kashmir divided by the Line of Control with Pakistan.